That's what Libraries are for. PLEASE NOTE: We are not taking book donations at this time. The next collection period will be in AUGUST 2019. We happily accept monetary donations year-round! The Friends of the South Plainfield Public Library is a non-profit organization whose members support the Library through advocacy, volunteer services, and fundraising. The Friends serve as advocates for the development, expansion and improvement of library collections, facilities and services to patrons. Promoting library excellence is the most important item on the Friends' agenda. Applications are available at the Library. Please make checks payable to Friends of the South Plainfield Free Public Library, Inc. Your donation is tax deductible! Questions? Call us at (908) 754-7885. Now you can make an online donation to the Friends via PayPal! Just click on the button below to get started! Your donation is tax deductible! Questions? Call us at (908) 754-7885. Please consider sponsoring shelving or furniture, or contributing to one of our other Library Fundraisers! FOURTH THURSDAY OF THE MONTH, AT 7:00 PM IN THE LIBRARY. PLEASE NOTE: Meeting schedules are subject to change. For upcoming meetings, please call the library to confirm time and date. Morven Museum & Garden (Princeton, NJ) NEW! *The Friends have made a special arrangement with the Liberty Science Center which allows $3.00 off the price of admission when you present your South Plainfield library card. BUY A BRICK FOR OUR WALKWAY! Become a permanent part of South Plainfield Public Library's history! Bricks will be installed on the walkway to the children's reading garden area, as well as around library grounds. Bricks may be engraved with up to 4 lines (21 characters per line). CLICK HERE FOR DETAILS. SPONSOR A SHELF IN OUR LIBRARY! Our library has over 80,000 materials! Please consider sponsoring a shelf. Your name(s) will be placed on a plaque to recognize your contribution! CLICK HERE FOR DETAILS. SPONSOR FURNITURE IN OUR LIBRARY!! Our library is a public space that needs furniture designed to last! Please consider sponsoring a chair, table, or lounge seater. We will engrave your name, or the name of your company or organization, on a plate to be put on your sponsored piece! CLICK HERE FOR DETAILS. Help the Library if you Shop on Amazon! The Friends of the South Plainfield Library will receive 0.5% from every eligible purchase you make through the Amazon Smile program! CLICK HERE FOR INSTRUCTIONS. Help the Library if you bank at Unity Bank! Are you a Unity Bank customer? Through Unity Bank's UCare program, you can name South Plainfield Library as your organization of choice and Unity Bank will make a donation to the library at no cost to you! CLICK HERE FOR MORE INFO. Help the Library if you Shop at Oak Tree Wine & Spirits! 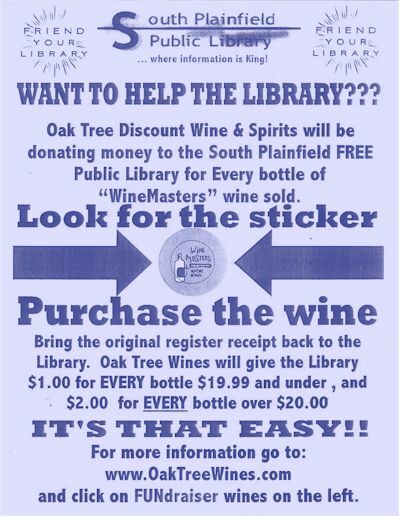 Oak Tree Wine & Spirits will donate money to the South Plainfield Library for every bottle of 'WineMasters' wine sold! CLICK HERE FOR INSTRUCTIONS.